This post was initially featured on DigitalMusicNews. You can find it here. Earning a living from art. It’s what every artist wants. But it can be hard, particularly for musicians. The competition is fierce, the supply of music is huge and the barrier of entry at an all time low, especially for electronic music. Younger generations only stream and pirate, and physical sales are declining. Only the most successful acts are able to make ends meet through just record sales. More than ever, publishing income is key. It’s essential to manage and exploit your musical repertoire, and look at alternative means to generate revenue streams in this realm. To make this happen you need to understand music copyright and publishing, and it’s a tough nut to crack. An incredibly dense subject, because of the constant changes in regulations and the non-universal laws and treaties. One country does it differently than another, and that makes understanding the different rights and systems hard. Every musician would be wise to grasp the basics of these principles, if only to know how to best delegate this to someone else. Copyright is the most important asset you have as a musician and understanding it’s concepts and how to maximize income from it can turn around your career, make you money and help you get exposure. I originally intended this guide to be a part of a larger article about all the possible income streams musicians can generate, but seeing as this subject required such deep explanation, I’ve dedicated a whole post to it. More on alternative income streams later. This article has laid out the essential concepts of music copyright and publishing, and unveils a plethora of ways to generate income from it and how to maximize those streams. Take your time to read this guide, and do dive deeper into the particular subjects via the links I’ve provided. Publishing income is the cornerstone of a musician’s income. In essence, publishing is the act of commercially leveraging music of composers and songwriters and getting them paid for it. This can be done by writers themselves or by an assigned representative – a publisher. We will proceed with the fundamentals of music copyright, so that you can form an understanding of the different rights pertaining to music and the different methods to exploit these. For more reading on publishing, check out this article. As a musician you are a creator. Whether you’re a composer, lyricist or performing artist, you create works. These works automatically become copyrighted once they are documented; for example through recording or writing. Copyright is a form of intellectual property. The creator becomes the copyright owner. If there’re multiple creators this right is automatically split equally. Writers are free to deviate from this equal share through mutual agreement. Copyright ownership rights give control over who can reproduce, distribute, perform publicly, display and create derivatives of a work. These ownership rights can be fully transferred and assigned to others. Others can also be granted licenses to use your music, typically in exchange for a payment. These payments are called royalties. They have the exclusive right to determine who can produce copies of their song, for example to create records. This right can be granted to others by giving out a mechanical license, which is done in exchange for a monetary payment (mechanical royalties). Whenever a record label or performing artist wants to record a song that they do not own, they have to get a mechanical license from the people that do. Always. All decisions regarding the composition can only be made when agreed upon by all copyright owners. As mentioned before, the ownership and control of copyright can be transferred to others. Generally, songwriters get a specialized third party, namely a publisher, to control and manage their songs. In exchange, they get a cut of the royalty streams which they help generate with the repertoire. Writer – publisher splits tend to range between 50%-50% and 70%-30%, depending on the clout of the artist and sometimes even on the relevant country’s regulations. A sound recording is the actual final recording of a song, a fixation of sound. It often goes by the name of ‘master’ from the old ‘master tape’ expression. The authors are the performing artist and record producer, who in essence are therefore the owners. Producers typically get a small share of the master rights (up to 12.5%). However, recordings are typically made in assignment of record labels, whom have negotiated deals with both the artist and producer in which they transfer ownership of their copyright to the label in exchange for royalty payments. Also it’s increasingly more common and easy for performing artists to record independently. In these cases the master ownership belongs to just them, or them together with the producer. There are many ways to use musical works and generate revenue from them, and I highly recommend you find a publishing agent to do this for you. They will register your works with the right associations, administrate your royalty income and most importantly, create commercial opportunities. Both writers and performing artists can benefit from working with a good publisher. Of course you can decide not to do this and manage your repertoire independently. Beware that this is a very time consuming and diligent task, as the publishing landscape is intricate and highly technical. A publisher typically takes a 30-50% cut of a writer’s royalties depending on the deal you negotiate, with the lower percentile more probable for artists with more clout. In some countries this rate is fixed, which is the case in The Netherlands. Here publishers take 33.33%. Publishers can also offer you an advance on your future royalty income, which may be interesting if you’re in need of funds for equipment or to cover recording costs. Taking an advance might result in having to hand over a larger royalty share to the publisher though. Standard publishing deals have a duration of 3-5 years. Take note that your contract will not expire if you haven’t recouped (earned back) your advance within that term. Take care to never sign away control over your works permanently, nor to completely transfer ownership. Your intellectual properties are your most vital assets as a musician. Handle with care. Royalties are the payments you receive in exchange for letting people use your intellectual property. As said, this is the cornerstone of a musician’s income. Copyright holders can grant licenses to others to use of their music, in exchange for royalties. Some licenses have to be explicitly granted, others are ‘compulsory’ and have to be granted as determined by law. These regulations typically have set fixed royalty rates for these types of licenses. I’m going to outline all different royalty streams which you can generate with your music, tell you how to set these up and how the royalty income is collected. Take note that a publisher is very likely to do a better job at managing this than you ever will. When releasing a record, labels want to have control or ownership of the ‘sound recording’ of a track. This is normally in the hands of the performing artist and producer. They assign these rights to the label in exchange for royalty payments, which are called the artist royalties and in cases where a producer is also owed monies there are producer royalties. To prevent confusion, modern (electronic) music producers are often both the composer and performing artist of a record. The producer royalty refers to a record producer in the old sense, where a producer may have been responsible for recording a band (thus called the record producer) and where the band members were the performing artists. In order to release a record, labels need to have control or ownership of the ‘master recording’ of a finished record. In cases where a recording hasn’t been made in assignment of a label (who then hires a performing artist and producers to do the job), the master rights are in the hands of the performing artist and the record producer. They can assign the ‘sound recording copyright‘ over to the label, in exchange for royalties. The label pays these royalties directly to the performing artist and producer, however the producer royalty is sometimes paid out of performer’s royalty, as it can be argued that this has been part of the ‘recording costs’ and should thus be covered by the artist and not the label. Decent label deals will obligate the label to issue royalty statements (income reports) at least twice a year, every six months. Payments are usually only made upon receipt of a valid invoice. You should proactively request statements and invoice, as labels will not pursue you to let you know they still owe you money. If you’re working with a publisher or manager, this is their responsibility, but to do their jobs they need to be well-informed of all your deals and accounting cycles. They may also need the occasional nudge. Whenever someone wants to reproduce or distribute a song that they did not write, they need to get permission from the musical composition copyright owner. This permission is issued via a mechanical license, for which in exchange mechanical royalties are paid. Record labels and performing artists request these licenses from the copyright holders to use their songs for actual recordings. Mechanical licenses can be issued directly by the writers (or their publishers) to the requesting party, or via a ‘mechanical rights society (MRS)‘. An example of a MRS is the Harry Fox Agency in the USA. In the USA and many other countries, songwriters are forced to give out mechanical licenses for their works as soon as these have been recorded and released to the public. These type of licenses are called compulsory mechanical licenses and the law has determined a fixed royalty rate which has to be paid for them called the statutory rate. The current statutory rate is $0.091 for every copy of a song shorter than five minutes. In practice, labels rarely acquire a compulsory license because it obligates them to issue monthly accounting statements, which is a lot of work. Regardless, the statutory rate is very important, as it is the benchmark for the maximum royalty rate anyone is willing to pay for a mechanical license. Logical, because if the writers demand a higher rate, the label can always get the cheaper compulsory license. Whenever a copy of your song is reproduced for sale (so pressed on CD etc), downloaded online or streamed, a mechanical royalty is owed. Even when the CD’s don’t sell. Writers and publishers can sign up with mechanical rights societies who will issue mechanical licenses on their behalf and administrate, collect the owed funds and account back to the right holders. In exchange, they take a percentage of gross revenues (around 7%). Most publishers will already have an existing deal with an MRS, so when signing up with them you’ll get an MRS representing your repertoire from the moment your publisher registers it with them. To maximize your income from mechanical royalties, you need to have music that’s high in demand (get many sales, downloads and streams) and get it tightly represented. Registration, administration and diligent accounting is key here, and best done by an engaged publisher that works closely with a MRS. Take note that MRS’ pay out four times a year, usually at the close of each calendar quarter. Whenever a composition is ‘broadcasted‘ or ‘used in public‘ the songwriter and publisher are owed a royalty. This includes transmissions over terrestrial radio (normal radio), network and cable TV, internet radio, interactive online streaming services and live performances. The broadcaster, live venue, network or service that benefits from the use of a composition has to pay the royalty. In exchange they get a ‘public performance license‘ to publicly perform the musical composition. As there is no compulsory license for public performance royalties, you need to get a license directly from the composition’s copyright holders to be allowed to broadcast or publicly use it. Writers and publishers can have their public performance rights represented by a ‘Performing Rights Society (PRS)’. These societies administrate, police income and issue licenses for the public usage of repertoire that’s signed up with them. In exchange they charge a yearly membership fee. In the USA there are three major PRS’s: ASCAP, BMI and SESAC. The PRS’ issue licenses to the users by offering them a ‘blanket license’, which is basically a free pass to use all the material in the PRS’ catalog, for a fee. They then divide these fees and send the writers / publishers their deserved share. Interactive streaming services such as Spotify and Rdio are contributing a share of their streaming income to the PRS’ to cover public performance licenses, and broadcasting networks (both TV, cable and radio) are scanned by automated systems of the PRS’ for their usage of works. Sometimes broadcasters are even required to deliver ‘playlists’ and ‘usage sheets’ to the PRS’ for proper administration. When it comes to payments, PRS’ pay out directly to both the publisher and the writers. They separate these payments to make sure that publishers do not get full control over the writer’s money and get too much power over them. Payouts occur quarterly, about a year after the royalties were originally collected. To maximize public performance royalty income, it is highly recommendable to sign up with a PRS directly as a writer, and also be affiliated with an engaged publisher that is signed up with one. Take good care to register your repertoire with the PRS and have the publisher do the same on their end. Additionally you should keep track of dates, set lists and broadcasts in which your music has been made public, so that you can check whether all of these have been accounted for and otherwise inform your PRS and publisher. Until now we have only discussed payments to writers and publishers for public performances of their compositions. In the USA, performing artists and record labels have not been paid at all for public use of their works for a long time. In 1995 this changed with the introduction of ‘Digital Performance Right in Sound Recordings’ which entitled featured performing artists and record labels to royalty payments for digital transmissions of their sound recordings (aka masters). These digital transmissions include: non-interactive streaming services (like Pandora), satellite radio services and non-interactive webcasts. The biggest PRS in the USA that focuses on the collection of these funds is SoundExchange, which pays out 50% of the revenues to the copyright owner (often the label), 45% to the featured performing artist and the remaining 5% to AFM / AFTRA funds for non-featured artists (like backup singers). To maximize this revenue stream, sign up to SoundExchange as a feature artist or master owner, and to IPRDF as a non-featured artist. Both are free to sign up to. SoundExchange has just switched to a monthly payout schedule, so can be very good for your cashflow. Many countries around the globe have long been paying performing artists and master owners for public performances of their music. To be specific, over 80 countries have acknowledged and enforce the Neighbouring Rights laws, which entitle the master owners to these payments. The USA is the exception here, whom only pays out to performers and master owners for digital transmissions. The monies generated from neighbouring rights are not to be underestimated and can constitute over a quarter of successful artists’ royalty income. It is becoming an increasingly important income stream with the diminishing record sale revenues, and has been a long time for pillar for performing artists who solely record, and do not write, in the countries that enforce neighbouring rights. Just like the other public performance royalties, the ones resulting from neighbouring rights are collected by PRS’. A few famous examples are Canada’s Re:Sound and the Dutch SENA. Both are non-profit organizations and are either free to join or charge a small membership fee. Take note that you can sign up to an international PRS to collect your neighbouring rights royalties. It is common practice even, with the Dutch SENA representing the catalogs of star acts such as The Beatles, Rolling Stones, Coldplay and Mumford & Sons. Whether you are entitled to public performance payments as a performer or master owner are dependent upon a country’s legislation. As a rule of thumb, you are entitled if the country where you recorded the song enforces neighbouring rights, or when the country of residence of the master owner does. Theoretically it would be smart to record records in countries which do enforce these laws, which I’m sure is an industry best practice. In regards to performers and labels from the United States, they are missing out on large chunks of revenue, as the enforcing countries refuse to pay out funds to a party who does not contribute to the pile. The reason for the USA’s reluctance in participating in neighbouring rights regulation is because the broadcasting industry has heavily lobbied against it (for it is a large and new cost). To maximize this revenue stream, sign up to a PRS that enforces neighbouring rights. This goes for both master owners and performers. Even if you’re a USA based, it could be worthwhile if you’re releasing abroad and getting broadcasted or played live there. Many countries enforce royalty payments to feature artists and master owners for home recording, lending and rental purposes. These royalties are intended to cover the revenue that is lost when people make home copies of music and lend or rent out copies for others to use. They are generated by the sales of CDs and media playing devices. These royalties are collected by the AARC in the USA, who just like the other royalty societies has agreements with other similar organizations abroad. Payouts of the AARC are split 40% to feature artists and 60% to sound recording owners and are based on physical and digital sales in the United States. To maximize this revenue stream sign up to the relevant collection society in your country. Some have split up the rental/lending and home taping royalty collection responsibilities, so make sure to research which are right. Find a comprehensive list of them here. Time to pay extra attention. This right here is the hidden cream of the crop. Synchronization is the usage of music together with visual output; commercials, video games, movies, tv shows, trailers, TV shows and such. Good synch deals can lead to massive exposure and big dough. 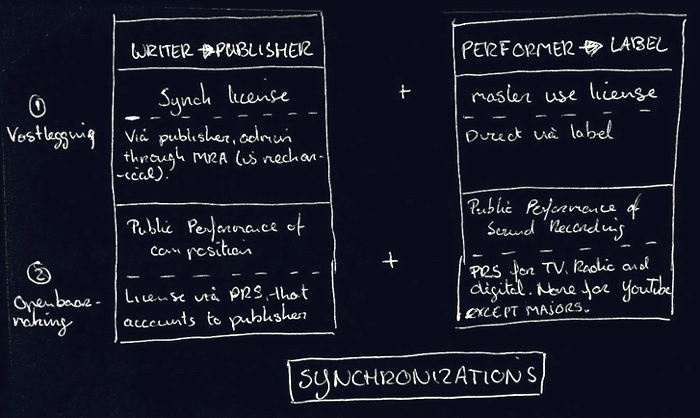 In order to use a track for a ‘synch’, the users need multiple licenses: a ‘synchronization license‘ from owners of the composition (typically the publisher on behalf of the writers) and also a ‘master use license‘ from the owners of the sound recording (typically the label) if they’re using the master. Also, royalties are due for ‘public performance’ of the composition and master, as the visual output is likely displayed to many people. In typical synch deals, clients will pay a ‘synch fee‘ for these licenses, which is a ‘buy out’ of future royalties for a flat fee, or pay an advance on royalties together with a lowered royalty rate..
Synch deals are mostly scored by a publishers, who chase these opportunities for the writers and catalogs they represent. The synchs market is very interesting because it is wide open and there are plenty of opportunities. There’s no set fees for synchs and high tier synchs can score into the tens of thousands of dollars. This is the case when charting pop records are synched to big Hollywood movies. Also there’s a lot of exposure to be gained. Think of the soundtracks of hit series…. bound to increase those artist’ record sales, not even to speak of public performance royalty income. There are different ways to make money from synching: using your existing catalog, by creating custom music and through monetization of YouTube videos. The latter is theoretically a form of leveraging existing music, but is so different in application that it deserves special treatment. All of these methods are lucrative both financially and for exposure. I’ve jotted down a drawing of the dynamics of synching. The left box represents the ‘musical composition copyright’ and the right the ‘sound recording copyright’. Level 1 concerns getting the initial synch, level 2 is about public performance of that synched work. To score synch deals for your music, opportunities need to be created where your music is matched up with visuals. You can pursue these opportunities yourself, but have much better chances if you have a designated publisher doing this for you. The clients that bring in the biggest synch business are: advertising agencies, video production studios (can be movies, TV, other video), big corporations, video game studios. There are publishers that focus solely on scoring synch deals from these clients. Many of these work on an exclusive basis for single tracks, or on a non-exclusive basis for total catalogs. Both typically claim exclusivity on a track as soon as a synch is scored. Typical publishing agreements are exclusive and cover all the work of a composer, so if your publisher does not actively pursue synchs, you’re missing out. If you are signed exclusively with a publisher who doesn’t, you can propose letting other publishers score synchs and have them divide the spoils. A tricky proposal, as all publishers want the full pie, instead of a piece. A strong counter-argument would be that they’re better off taking a smaller cut off a big chunk of revenue, than the full share of revenue. Assuming you’re not exclusively signed, you should upload your catalog to a number of non-exclusive synch publishers. Most of these have online libraries where they showcase the repertoire they represent, and label it according to style and mood. Their clients can then browse their libraries in search for that specific track they need. Also they have creative agents that actively match tracks in their catalog to the client’s wishes, and sometimes even offer ‘custom music’ opportunities. More on that later. A few reputed synch focused publishers are: MusicDealers, PumpAudio, JinglePunks and MusicSupervisors. I’ve have had great experiences with MusicDealers. They are a blast to work with and have created multiple opportunities for our label’s relatively small catalog, in a short span of time. This is no shameless plug, just an observation. When signing up to these publishers, be wary to check how they register your tracks with PRS’ in case of a synch. Some fraudulent parties re-title the tracks so that they do not just collect royalties resulting from their synch, but from everything. If the track in question is a charting hit, then that’s trouble. Screen for this in the contracts for you, looking for anything ‘registration’ related. To maximize this revenue, make sure that your publisher is actively pursuing synch opportunities if you’re exclusively signed. If you’re not, increase your odds by uploading your catalog to multiple non-exclusive synch publishers. Then foster personal relationships with them. If you have a decent size catalog with quality music, which you register and label correctly, you’re inevitable going to get business. Make sure to have instrumental versions of all your music to upload, as roughly 75% of all synchs are instrumentals. Alternatively, you can look for opportunities independently by offering your catalog to the music supervisors of the clients mentioned prior. Your odds will be much better when working with someone who has a reputation for filtering out quality material though. Many synch opportunities will demand music that is custom tailored to specific wishes. Think of commercial jingles, or sound design in movies. This can be made in assignment of synch agents and publishers, or as ‘work for hire’ for an employer. In the latter case, the copyrights are assigned to the employer. The royalties earned by doing custom synch opportunities are just as lucrative as traditional synchs, maybe more even. Big business. And the interesting thing about creating custom music, is that it is a specific skill. Songwriters and electronic music producers (as they are typically both writer and performer) are predisposed to be good at it. And it’s a breath of fresh air, according to my artists, whom see it as inspirational and a break from their typical music making routine. My experience is that musicians quickly get better at crafting music specific to demands, and that developing a network in the niche isn’t hard – inevitably you’re going to score synch opps, required you put in the necessary effort. Custom synchs opportunities come from the same parties as traditional synchs, namely: publishers, synch agents and music supervisors of video and game production companies. And just like traditional synchs, you’re most likely to find assignments by partnering up with synch agents and publishers that specialize in dealing with these kind of clients. Typical synch opps have a short time window of about 48-72 hours, that is from being given the assignment to final delivery. Therefore it is very important that you’re able to create and turn around music incredibly quick, following guidelines, without using any uncleared samples and have the flexibility to create edits whenever demanded. This implies that your communication needs to be professional and swift. To maximize this revenue, you need to find parties willing to give you assignments. I highly recommend working with a dedicated publisher, or multiple non-exclusive synch publishers. It is added value to have a decent sized catalog of existing music, but far more important that you open up a good line of communication with your publisher, and let them know that you are eager for these opportunities and can rapidly deliver quality music in a professional manner. Synch publishers tend to prefer working with people that represent a pool of writers, like A&Rs and artist managers, as this is more efficient for them than just one-on-one with artists. Therefore, the synch publishing field can be extra beneficial for label and other publishers. YouTube has accumulated billions and billions of play on videos, many of which use copyrighted music. As a writer or sound recording owner of that music, you can receive royalties for those views. We call this YouTube monetization. The process is simple. YouTube has an ad system, which places ads on videos. 55% of the revenue that the advertisers pay to YouTube is then accounted towards the copyright holders of the content. Theoretically, the uploader of a video that uses music that isn’t his, needs to get permission from both the copyright owner of the musical composition (publisher on behalf of writer) and master (performing artist or label). From the publisher he needs a ‘synch license‘, which is issued by the publisher (or writer if they’re unrepresented), and from the label a ‘master use license‘. The royalty payments for those licenses are freely negotiable between the parties and are rarely regulated. Besides royalties for synch licenses, songwriters and publishers are also owed money for ‘public performance’ of the repertoire, which YouTube views contribute toward. This is paid via their PRS’, whom have direct deals with YouTube for collection of these funds. Major labels also have direct deals with YouTube for this. In practice, these licenses are rarely sought after by uploaders. There are thousands of videos on YouTube that use copyrighted content without permission. Much of this is tolerated under the ‘fair use‘ policy. Even monetization of those videos. As the copyright owner of a composition or master, you can take initiative to monetize videos in which it has been used. To start monetizing, you need permission from the other copyright owners, including the video uploader (whom has a video copyright). To find out where copyrighted content has been used, YouTube has introduced the Content ID system in which rights holders can upload their content and the system will automatically find matches. You can sign up to YouTube’s own Content ID platform, or to an external service which specializes in YouTube monetization and taps in to the Content ID system through their own deals with YouTube. Audiam is an example of such a service (mind you, they take a 25% cut of your revenue). Also there are ‘YouTube Networks’ which aggregate YouTube channels, often in the same niche, and help them monetize and optimize their content, and attract traffic. The advantages to networks is that they offer better ad revenue rates as they can negotiate with collective power. The biggest music focused network is INDMusic. For more information about networks, check out this article and take a look at the top 100 networks with the most subscribers. Once your music has been matched up, the video uploader will get an inquiry by YouTube asking whether they have received permission to use your content. If they haven’t, they can either allow monetization and keep the video, or take the video down. To maximize this income, you should partner with a network or YouTube collection company. They can offer you higher ad revenue rates, and are much better equipped to get the most out of content, through accounting and matching systems, attracting traffic to your channel and helping you form a better strategy. As always though, your personal relationship with this partner is key. Only sign with a network that you can properly communicate with, whom you know will actively work for you. Sampling is the use of a piece of an existing composition and sound recording for use in another sound recording or composition. As a musician you’re probably already familiar with the term, and we all know about those charting pop hits that have sampled catchy parts of old school hits. In order to use legally use a copyrighted sample, you need to get permission from the copyright holders of that sample. This is called ‘clearing‘. Who you need to clear with depends on what you are sampling. If you’re sampling a composition, then you solely need permission from the copyright holder of the composition (probably a publisher on behalf of the writers). If you’re sampling a master, then you need permission from both the copyright holder of the composition (publisher on behalf of writer) and the sound recording (label or performing artist). The publisher needs to grant a right to create a derivative work and the label a right to reproduce the master. In both cases, you will have to deal with the copyright holders directly as no royalty rights societies or other parties can issue these rights. Hardly any regulations for the payment for these licenses exist, so payment is freely negotiable. Royalties are typically paid for these licenses, where both the right holder of the composition (publisher) and master (label) both need to be compensated separately, unless they’re part of one and the same entity. Typical compensation would be a share of royalties, of which the size would be determined based on the popularity of the original sample and the predicted success of the record in which the sample will be used. For records that aren’t expected to be ‘huge’, both the publisher and label will often go for a ‘flat fee buyout‘, in which they give up their royalty share in exchange for a one time monetary sum. You can avoid having to clear samples by using not a piece, but the full composition, for your new recording. That’s what we call a ‘cover‘ and you can get the permission to record it by simply getting a mechanical license. However, with a cover you are restricted from deviating from the original work. In other words, you can’t change it. Another way to avoid having to pay for sample fees is by using copyright free, or creative commons works. These are works issued under a specific degree (by the original copyright owners) to be free for public use, with a few minimal restrictions such as the mention of the creator’s name, and others. Read more about creative commons here. To make money from sampling, there’s multiple methods. This is when others take a piece of your composition or master to use in their works, for which in exchange you get compensated. A way to monetize your existing repertoire. This is hardest form of sampling to actively pursue, as people are likely to use your work only if it has a degree of notoriety and sound. Logically, the tracks and compositions that are most sampled are the ones that are most famous, or classic. Stock music is the name for music that’s created with the purpose of licensing it for usage in other media, such as video, radio and television, or even in other people’s compositions. It’s different than traditional synch licensing as the focus here is on creating large catalogues of this music, not individually crafted custom pieces. The method of sale differs too, as these libraries are for clients to browse themselves, in contrast to (custom) synch publishing, where a publisher is actively trying to cater to the client’s needs. Stock music has many different forms: sample and construction packs(for music production), sound effects (for whatever purpose), whole pieces of music, jingles, loops and everything in between. Stock music is sold via stock music libraries or websites that specialize in particular types of stock music. These parties typically license music for a flat fee, or via a subscription to their service which gives a blanket license to use all their music. Most stock music is free of public performance royalties. As a creator, you can license your music to these stores and libraries exclusively, or non exclusively. Most libraries that demand exclusive licenses offer a ‘flat fee’ royalty buyout, or will even purchase the full copyright ownership. When exclusive libraries pay royalties instead of a flat fee, they tend to pay a higher rate than their non-exclusive counterparts. The non-exclusives rarely offer flat fee buyouts. The exclusive libraries will also do full buyouts when concerning ‘work for hire‘ music. This is when you create music on specifically on their demand, for example when you create a ‘dubstep sample pack’ for a sample pack webshop site. They could then give you a flat fee buyout, take the sample pack, re-brand it to be one of their ‘home grown’ products and put it in their store. The stock music world offers many opportunities, as it has blossomed since the rise of the internet. There’s so many libraries which are easily accessible for both consumers and creators. One might say that there is too much supply, as the making of stock music is easy to get in to. Particularly sample packs, sound effects and jingles are easily fabricated by electronic music producers. It’s worth investigating if you want to earn an extra buck, but you’ll have to be careful to not get caught up in the flood of material, and be selective about the libraries you work with and music you supply. To maximize this income, refrain from signing exclusively with any library, and instead making a selection of a few high quality libraries with curated and oversee-able catalogues, and selling music there. Focus on creating sounds that are high in demand or deep within a specific niche. For a list of stock libraries, check out this and this article. To get with specific shops that sell sample packs and the sort, to create ‘work for hire’ packs, get in touch with the owners of the site. That’s that. You should now have a good understanding of the fundamentals of music copyright and publishing. It might be wise to re-read this guide multiple times, or to grab back to it whenever you encounter a subject that we’ve discussed here. 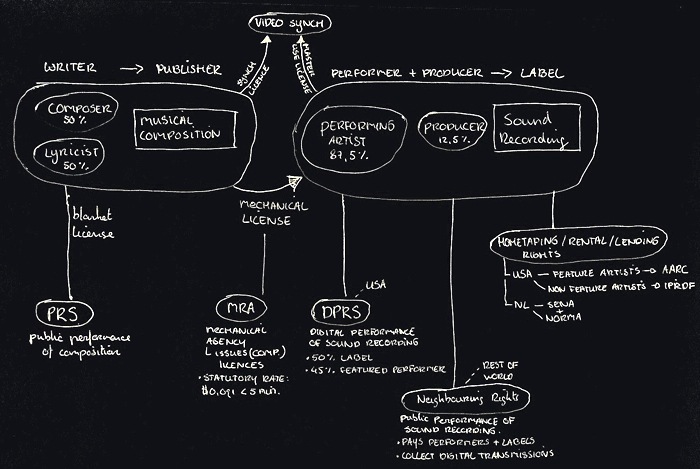 I’ve drawn out a visualization of the flow and dynamics of music copyright, licenses and royalties. See if you can decipher it based on what we’ve learned. To better grasp the subject, I highly recommend the book ‘All You Need to Know About the Music Business‘ by Donald Passman (not an affiliate link). Also there’s a lot to be said for just getting lost on the relevant Wikipedia pages on music copyright. Start off here or here. As mentioned at the start of this article, this was intended to be a part of a larger article about all possible income streams for musicians. I will follow up with a new article about alternative income streams soon, where we discuss the many other ways to make money from your musical talents.